It’s more important than ever to create compelling loyalty marketing programs. Consumers are becoming increasingly choosy about where they want to shop and a loyalty program can improve engagement as well as distinguish a retailer from their competition. However, successful loyalty programs must be about more than points and the occasional offer. Using CodeBroker’s mobile engagement platform, retailers are creating loyalty marketing programs that enhance the relationship with their customers. Signing up new customers to a loyalty program should be easy. CodeBroker retailer customers have realized tremendous success signing up their customers using CodeBroker’s loyalty program sign-up capability, Smart Join. Smart Join lets you collect customer data securely minimizing data entry mistakes while providing the optimal customer experience. Stand out from your competitors by creatively engaging with your customers in more meaningful ways. For example, you can use CodeBroker’s mobile engagement platform to deliver exclusive offers or announcements to special events. Occasions such as, celebrity endorsements, private sales or elite customer recognition parties are great ways to honor your most loyal customers. Deliver personalized information relative to an individual customer letting them know that you care. Programs such as alerting your customers with rewards program balances, merchandise is ready for pick-up notices, or delivering offers based on past purchases have proven to increase customer lifetime value. Retailers use CodeBroker’s mobile engagement platform to deliver a rich customer experience. Improving the customer experience using mobile is proven to build brand loyalty. To learn how one CodeBroker retailer customer signs up tens of thousands customers per day to their loyalty program, click on Building a Successful Loyalty Program Case Study. 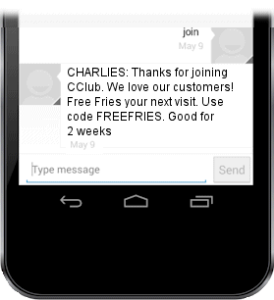 The retailer dramatically increased the size of their SMS marketing list using Smart Join. As an incentive for joining, the retailer delivers a rich welcome offer. 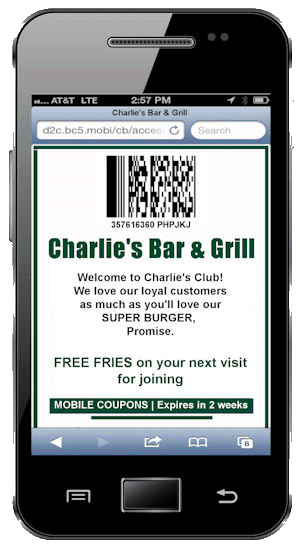 CodeBroker’s secure one-time-use mobile coupons ensures the welcome offer is redeemed only once, regardless of the number of channels their customers choose to save or view the mobile coupon.